World War II Museum, La. 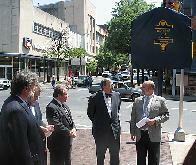 Jewish Pioneer, Indian Trader, Merchant and Religious community leader when Lancaster, Pa. was the frontier of America. Replete with Bemah, Ark and Torahs, Simon's home became the synagogue and a magnet for the Jews on the frontier of Pennsylvania. 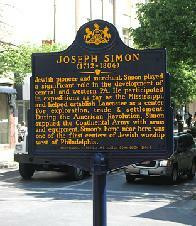 The marker text reads: Jewish pioneer and merchant, Simon played a significant role in the development of central and western PA. He participated in expeditions as far as the Mississippi, and helped establish Lancaster as a center for exploration, trade & settlement. During the American Revolution, Simon supplied the Continental Army with arms and equipment. Simon's home near here was one of the first centers of Jewish worship west of Philadelphia.